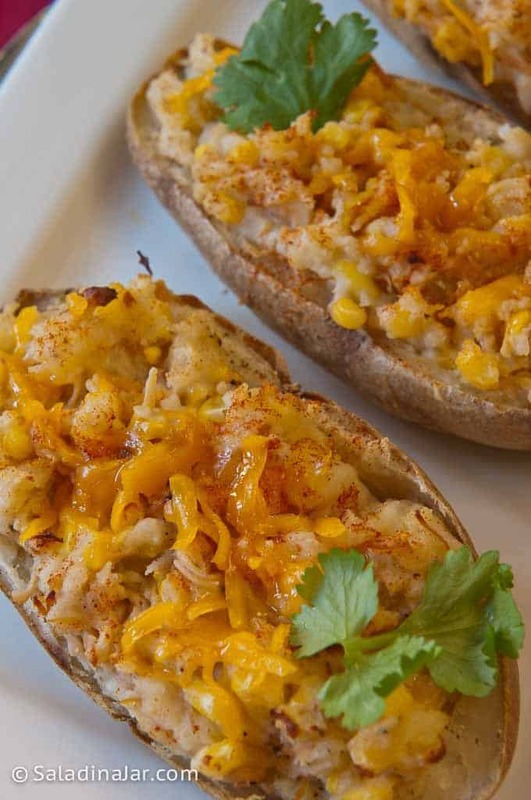 Southwestern Chicken-Stuffed Spuds with chicken, green chilies, corn, and cheddar cheese make a one-dish meal perfect to eat now or freeze for later. What do you do with rotisserie chicken leftovers? My leftovers go in the freezer. Almost always. The cut-up chicken is there waiting for me whenever inspiration strikes. You must add this recipe to your list. 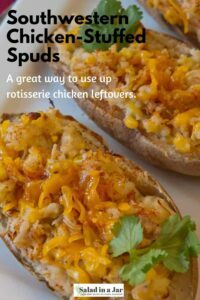 My youngest son used to ask for these stuffed potatoes when he was still living at home. My kitchen is still undergoing minor renovation as I mentioned in my last post. My bulging freezer is my friend, especially when these stuffed potatoes have been stashed away for times like this. Of course, they are best when freshly made, but I always make a lot so I can freeze the extras. This recipe is ideal for using up that 10-pound bag of potatoes you haven’t been able to consume in a timely manner. One note about the chicken. Have you discovered the prepackaged and marinated cilantro-lime chicken? I’ve seen and purchased it in several grocery stores. However, they seem to be a moving target. If you can find them, the chicken is wonderful for this recipe. I place a frozen package in my crockpot before I go to work, (sprinkled with about a teaspoon or two of taco seasoning mix), When I get home a few hours later, the aroma signals that my tender and flavorful chicken is ready. Shred it to use in tacos, salads, quesadillas, burritos, all kinds of Mexican casseroles, and these potatoes. It also does wonders for my salad. If you can’t find it, rotisserie chicken is a good substitute. Southwestern Chicken-Stuffed Spuds with chicken, green chilies, corn, and cheddar cheese make a one dish meal good to eat now or freeze for later. Place washed potatoes onto rimmed baking sheet. Bake for 1 hour at 400 degrees or until knife is easily inserted and removed. Slice potatoes in half and allow to cool for 5 minutes. Use an ice cream scoop or serving spoon to remove innards from potatoes, leaving a 1/4 inch thick layer inside the skins. In a large bowl, add chicken, corn, green chilies, sour cream, milk, butter, and salt and pepper to potatoes and mash by hand. Add more milk if necessary to make potatoes stick together mashed-potato style. 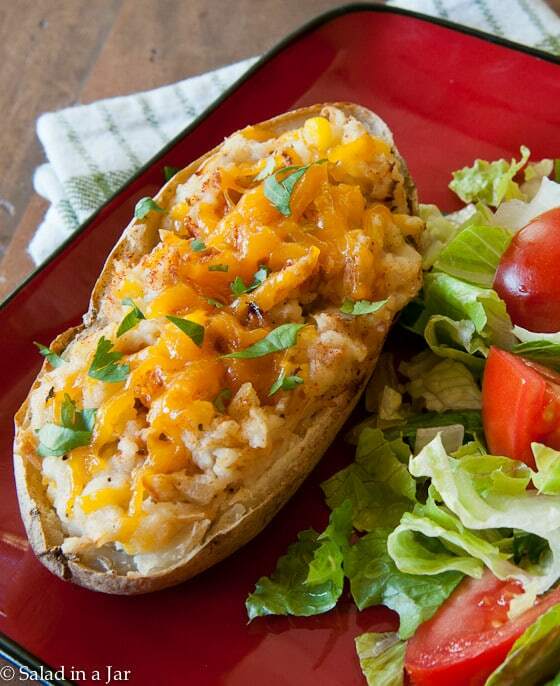 Spoon seasoned potatoes into shells. Sprinkle generously with paprika---smoked paprika if you have it. Bake in 375 degree oven for 15 minutes or until heated throughout. Sprinkle cheese on top the last 5 minutes. Garnish with chopped cilantro. If potatoes are frozen, add to time in the oven or microwave first until thawed. My family really liked these spuds! I wasn’t sure how much butter to put in (mentioned in instructions, but not in the ingredient list), so I went with 2 tablespoons. Given how easy these potatoes, I will definitely be making them again. Thanks so much! Glad you liked these potatoes. And also thanks for the heads up on the butter issue. I’ll try to fix that. Looks wonderful! I love using stuff in my freezer, AND using those 10 lb. sacks of potatoes before they decide to pro-create in my pantry too! These look so good! Do you cook them completely and then freeze them? Or do you leave off the cheese, or stop after step 5? I never knew you could freeze potatoes. I’ve got to try this. I don’t cook them at all if I’m going to freeze them. (Everything in them has already been cooked.) I add the cheese in the last few minutes of baking. Of course, these are best fresh, but the cream cheese, yogurt, or sour cream (whichever you use) makes them hold up a little better in the freezer.